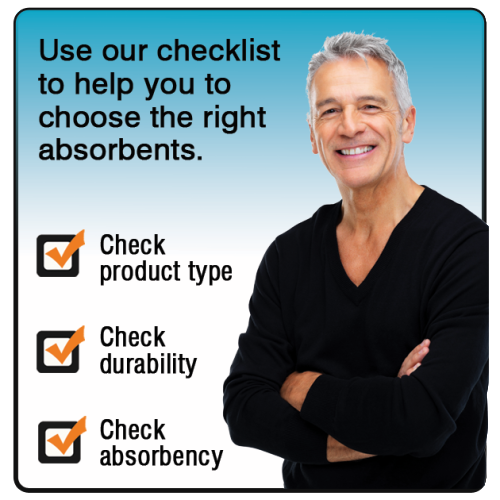 Use our easy to use industrial Sorbent Selection Guide to help choose the right absorbent for your specific application. 1. Determine the type of liquids to be absorbed. 2. 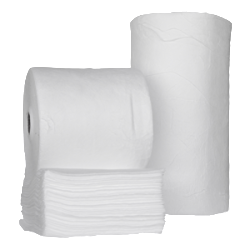 Identify your absorbent application. 3. Determine the amount of liquid to be absorbed. Use all-purpose absorbents to cleanup oils, coolants, solvents and water-based fluids anywhere in your facility. 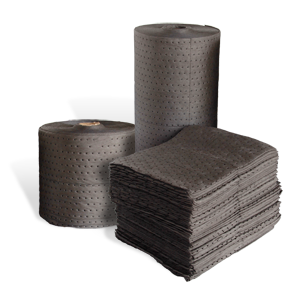 Use gray industrial absorbents around machinery, under leaky pipes or fittings, in messy traffic areas, for general maintenance projects–they are your first choice for indoor spill control. Plus, their gray color masks spills and stains, helping you resist the urge to pick up the absorbent before it is fully saturated. Gray universal sorbents absorb coolants, solvents, oils, gasoline, vegetable oil, kerosene, latex paint, and other water-based fluids. 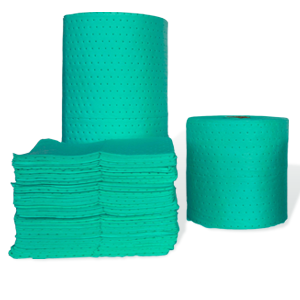 These absorbents are specialized for oil and other petroleum-based spills, including paints and other non-water soluble chemicals. These absorbents will not absorb water and will float indefinitely. White and blue oil only sorbents absorb hydraulic oil, motor oil, brake fluid, cooking oil, turpentine and other oil-based fluids. Surfactant-treated polypropylene absorbents can be used on a wide range of chemicals, including hydrofluoric acid, and are chemically inert, so they will not react with aggressive fluids. acid, sodium hydroxide and other unknown chemicals.